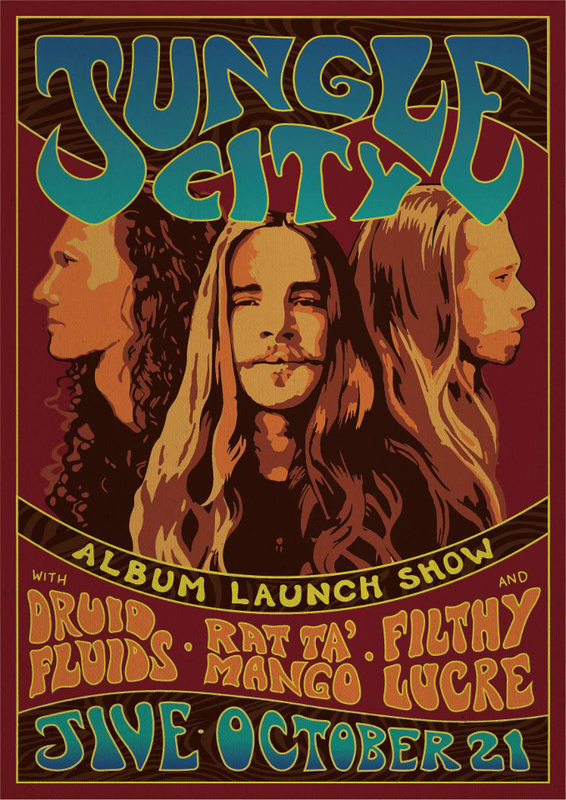 After a huge year of writing, recording, gigging and voyages interstate, Jungle City are excited to throw a huge party at Jive to celebrate the release of their new album Jungle City 3!! Recorded in their own Little Cat Studios and produced by frontman Brenton Wilson it is their most ambitious project to date and features 9 new tracks in a vast kaleidoscope of rock and roll. Joining the party are 2 piece powerhouse Filthy Lucre, Blues rockers Rat Ta’Mango and psychedlic dreamers DRUID FLUIDS. Doors are at 8 and entry is $10. Limited run of CDs and one off custom tie dye tees available on the night!